Life doesn't always go how we plan does it? I certainly didn't plan to be a newlywed bride with a badly broken leg. I broke it August 21st, after we'd been married only 3 weeks. After waiting almost two weeks for surgery, I'm now at home, laid up for many more weeks, and unable to do much of anything. So much for keeping my house spotless or any of the painting projects I had planned! I won't be able to put any weight on this leg until around the first of November. After that I will have weeks of therapy, stretching it out and re-learning how to use it. And I can't even think about working until at least mid-December. So I have had to re-evaluate my plans, laying it all in the Lord's hands instead of mine. I am a newly-graduated Registered Nurse, who can't work. And I'm a new wife, who can't take care of her husband or her house. What does this mean for me? Only a few days after I broke my leg, I remember crying on Will’s shoulder, asking him, "How I can I possibly be a good wife now? I can’t even do anything around the house or for you." He seemed shocked that I would even wonder that. But for so much of my life, I've measured my devotion and service for God by how hard I work. I've always thought that the best way to show God (and others) my love is by hard work. After all there are a lot of verses about not being lazy!! I guess I carried some of that thought over to marriage, too. I always thought that the Proverbs 31 woman was an excellent wife because of how hard she worked for her family. But now that I can't clean house or cook meals or wash the laundry, I’m finally beginning to see just how skewed my view of things really has been. So I have been re-looking at Proverbs 31 and learning how to apply it in light of my current circumstances. The Proverbs 31 woman is called “virtuous.” According to Matthew Henry, this “…is a woman of spirit, who has the command of her own spirit and knows how to manage other people’s, one that is pious and industrious, and a help meet for a man…. [and] is a woman of resolution, who, having espoused good principles, is firm and steady to them, and will not be frightened with winds and clouds from any part of her duty.” So in other words, a virtuous woman is much more than just hard working. She is a woman of wisdom and discernment, who stands with strength. One of the biggest things I see when I read this passage is that this woman has a heart open to the Lord’s leading. She follows His commands and guidance, allowing Him to lead her in all things. That is where her strength and wisdom comes from! Her excellence comes from her fear of the Lord; and all of her virtuous characteristics flow from this. While I'm laying here with my leg propped up, I've had a lot of time to think. I know that the Lord is using this time to draw me closer to Him. Right now, there is nothing for me to do but to be still and listen to the Lord. I don’t know why it is, but it seems that all the hard circumstances I have gone through, my first reaction is to pull away from the Lord, rather than draw near to Him. I hide away inside myself or in the comfort of friends, rather than go to the Comforter and Healer of all. Quickly I begin to see what a mistake that is, though. No one can bring joy or peace or comfort like the Lord. “The salvation of the righteous is from the Lord; he is their stronghold in the time of trouble. The Lord helps them and delivers them; he delivers them from the wicked and saves them, because they take refuge in him” (Psalm 37:39-40). What a wonderful refuge He is!! So what am I doing with my days now? I am knitting blankets for a crisis pregnancy center, managing our finances, trying to keep the house in order, finally writing wedding thank-you notes, knitting blankets (planning to give them to a friend who's church knits blankets for a crisis pregnancy center) and learning more about different ministries I am interested in. But mostly, I am sitting at the feet of Jesus, and learning from Him. I promise, I have a good reason for my long-time silence on here. In May I graduated from nursing school, and ever since then, I've packing up and planning. 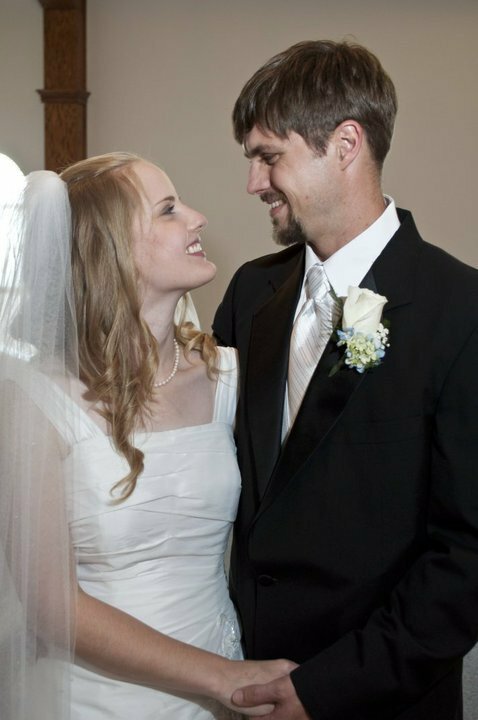 Because on July 31, 2010, I married my best friend! Now we are beginning our lives together. It is a beautiful, amazing time in our lives! We have lived hundreds of miles apart throughout our entire relationship, and it is so wonderful to be able to just be with my love, every day. Now I have a huge amount of work to do on moving us into our new house, along with cleaning it and getting it fixed up. I'm hoping that I'll eventually get time to start posting regularly again. But for now, I hope y'all will excuse me if I am a little slow with posting. I'm just too busy to get on here much! Why is it that I regress so easily into the very things I feel I have already overcome? The very areas where I think I am the strongest, sometimes I fall the hardest. Sometimes all I feel is frustration and an overwhelming sadness. I let myself give into my selfishness and pride and act just like a kid having a temper tantrum. I get aggravated and, even though I might never show it on the outside, I'm fuming on the inside. Why do I never seem to change? The question that I keep wrestling with the most is how can I claim to be filled with Christ, but then the thoughts in my head or the words that come out of my mouth have nothing to do with Him? I am so full of flaws and failures! Today my sister and I had to stay home from church due to illness, so we watched a sermon online instead. One of the things that the pastor said really stuck with me. Basically he said, "True repentance is wanting Christ more than any sinful passion." It's turning away from that angry feeling because you know that it won't really bring satisfaction. Instead we turn to Christ, and we find true happiness and peace. I am so overwhelmed by Christ's grace and mercy and love toward me. I deserve none of it. He has no reason to love me like He does. The Katie in me is full of selfishness and pride. But the Christ in me is full of love, joy, peace, patience, and kindness. All that I can say is, "More of You and less of me!" "Not that I have already obtained this or am already perfect, but I press on to make it my own, because Christ Jesus has made me his own. Brothers, I do not consider that I have made it my own. But one thing I do: forgetting what lies behind and straining forward to what lies ahead, I press on toward the goal for the prize of the upward call of God in Christ Jesus" (Philippians 3:12-14). "Do not be anxious about anything, but in everything by prayer and supplication with thanksgiving let your requests be made known to God. And the peace of God, which suppresses all understanding, will guard your hearts and your minds in Christ Jesus." What a wonderful promise! To have God's peace guarding my heart and mind; I can think of nothing better. "Today her health deteriorated very rapidly between the first signs of something wrong at 11am (fever, wouldn't finish milk) and 3pm - very pale, skipped feedings, diarrhea, vomiting, troubled breathing. By 4pm she was being intubated at the best clinic in town as three of us agonized outside the doors of the ER.... Now Victoria is in the NICU on a ventilator. I was finally able to go in and see her for just a few minutes at 9:30. By that point she was semi-conscious and stabilized, and pneumonia has been ruled out although they're running more tests. It appears to be some sort of gastro intestinal infection that threw her into such a tail spin so quickly today." So please keep her and her tiny sisters in your prayers!! The intoduction to Psalm 56 tells us that it was written, "When the Philistines seized him in Gath." This psalm was composed during on of the most turbulent times in David's life. He had every reason, according to human standards, to fear. Yet what is this psalm all about? Not fearing. ...This I know, that God is for me. word I praise, in God I trust; I shall not be afraid. What can man do to me?" (v. 3-4, 9-11). Over and over David repeatedly tells himself that he trusts in the Lord, that man is nothing. You can hear his torment in this psalm; he is so burdened that he must keep reminding himself not to fear. Instead of allowing himself to worry, he speaks hope into his soul, trusting God for strength. This is what I must do as well when the storms rage. Often the only way to get through is to speak the truth to myself again and again. Sing songs of God's strength, pray constantly, get into the truth of God's Word--but do not fear! I have been extremely neglectful of this blog lately! I wrote the rest of the parts to the "Worry Not" series over a month ago, but I haven't found the time to type them up and post them. Finally, though, here is the second part. Better late than never, right? So rather than worry, what is a child of God supposed to do? Reading through the Scriptures, I have seen a lot of examples lately of men who had every "right" to worry, but chose instead to trust in the Lord. The first example I'm going to give is King Hezekiah. In 2 Kings 18-19, we are told how Sennacherib, the king of Assyria, attacked Judah, which was being ruled at this time by King Hezekiah. Hezekiah receives a message from some of his most trusted servants that Sennacherib was threatening Judah with total destruction. Rather than fear Sennacherib's enormous army, it says in 2 Kings 19:1, "As soon as King Hezekiah heard it, he tore his clothes and covered himself with sackcloth and went into the house of the Lord." He prays to the Lord, and Isaiah the prophet sends him a message from the Lord reassuring him that Sennacherib will go back to Assyria without touching Judah. However, we don't see Sennacherib turning back immediately. He comes back the next day, threatening again, this time even tempting Hezekiah to stop trusting in the Lord. He tells Hezekiah in a letter, "Do not let your God in whom you trust deceive you by promising that Jerusalem will not be given into the hand of the king of Assyria." Hezekiah, however, does not waver in his faith or worry about what will happen. Rather than worry, Hezekiah went and "spread it before the Lord" (v. 14), laying all his burdens at the Lord's feet. God rewarded Hezekiah's faith by killing the entire Assyrian army. He tells Hezekiah, "...He shall not come into this city or shoot an arrow there, or come before it with a shield or cast up a siege mound against it....For I will defend this city to save it, for My own sake and the sake of My servant David." The Jews didn't even have to raise their hand against the Assyrians! The Lord has constantly displayed this in my own life. How gracious He is to me, even when it comes to the smallest things I worry about! Over and over again, I will worry about something only to have Him gently remind me that He has it all under control. And suddenly, the problem will be taken care of--without my doing anything! What a loving God we serve, who provides for our every need! Many are the plans of in the mind of a man, but it is the purpose of the Lord that will stand. Isaiah 42:16--And I will lead the blind in a way that they do not know, in paths that they have not known I will guide them. I will turn the darkness before them into light, the rough places into level ground. These are the things I do, and I do not forsake them. To love at all is to be vulnerable. Love anything, and your heart will certainly be wrung and possibly be broken. If you want to make sure of keeping it intact, you must give your heart to no one ... lock it up safe in the casket or coffin of your selfishness. But in that casket ... it will change. It will not be broken; it will become unbreakable, impenetrable, irredeemable. Albertine--"Now that I have seen, I am responsible..."
This song was written by Brooke Fraser after she traveled to Rwanda. Albertine is an orphan she met while there. I am a child of God on the path to holiness. I a senior in nursing school at a university about an hour away from my home. I live with my parents, my twin sister, my 14-year-old twin brother and sister, and my 7-year-old baby brother. I am engaged to marry my best friend and can't wait to set out on the journey God has planned for us together!